Unilever, the world's second-largest FMCG company, has elevated Hindustan Unilever's human resource head and executive director Leena Nair as its global senior vice-president for leadership and organisation development. 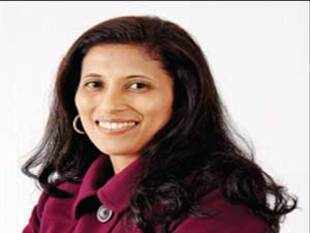 MUMBAI/ NEW DELHI: Unilever, the world's second-largest FMCG company, has elevated Hindustan Unilever's human resource head and executive director Leena Nair as its global senior vice-president for leadership and organisation development. Nair, 43, will shift to the London headquarters of the Anglo-Dutch company and report to Doug Baillie, the chief HR officer of Unilever, from January 1, 2013, a company spokesman said. Being one of 5-6 people reporting directly to Baillie, Nair will have a fair shot at taking up the top HR job in Unileverwhen her 57-year-old boss moves on. Nair could not be contacted as she is on an annual leave. The development puts the spotlight on a new breed of Indians that multinationals groom for top jobs globally - people managers. At least half-a-dozen Indians have moved to global human resource roles in the past two years, mainly because of their experience in a culturally diverse country like India. The experience in India helps the professionals deal with a multi-ethnic workforce spread across the world. "(The) Indian workforce is quite diverse and has different kind of sensitivities. Exposure to such diversity becomes a very important virtue at a global level considering they are well-equipped to handle challenges better," says AdityaNarayanMishra, president (staffing business) at Randstad India, a division of the world's second-largest HR services firm Randstad Holding NV. Earlier, Indians, with their inherent knowledge of a challenging but high-potential market environment, were mostly chosen for operational roles globally as multinationals shifted focus to emerging markets to maintain growth momentum. A gold medallist from XLRI, Nair has been with Hindustan Unilever for two decades and is credited for a number of HR interventions, including 'Career by Choice', a programme which allows women who have fallen off the career ladder to rejoin the workforce. Since 1992, when she joined HULas a summer trainee, Nair has had many firsts to her credit - from being one of the first women managers to opt for a factory stint, in the industrial belt of Taloja, to becoming the first woman on HUL's management committee and its youngest executive director five years ago. Her participative style of working can be gauged by the fact that last month she engaged with top-rung B-school students to give them a taste of real-life leadership as a part of a larger sustainability mission. "There is more collaboration (being seen now). In the past, leaders were directive. You had one leader and everybody would follow. (Now) it's about participative leadership. It's about co-creating along with your team, along with your external partners," she told ET last month, referring to the company's focus on partnering, collaboration and participative leadership. Come January and Nair will join a growing number of Indian HR managers taking up global roles in multinationals. Three months ago, Levi Strauss & Co named Varun Bhatia as its chief human resources officer, while last year Pavan Bhatia took charge as chief people officer at PepsiCo Greater China Region after a four-year stint in India. In 2011, former HR head of ICICI Prudential Life Insurance Shubhro Mitra was elevated as regional chief HR officer at Axa Asia. Around two years ago, Sujata Tyagi, HR director at L'Oreal India, was appointed HR director for Asean & India, based in Singapore. GE's HR head Atul Joshi too has migrated to Novartis' consumer business as regional head-HR, Asia-Pacific. Experts feel this is just the beginning of Indian HR professionals being recognised as great people managers in companies that operate in more than 100 countries, each country having unique cultures and issues. "Diversity is the biggest agenda for all global CEOs and boards. Thus, being Asian and a woman means your career could accelerate to the highest echelons of the global corporate world," says Vibhav Dhawan, managing partner at Positive Moves Consulting. "India has 30 million expats worldwide and is the only net exporter of leadership talent amongst all emerging markets with others like China, Russia and Indonesia being net importers. The world needs to acknowledge more and more Indians will reach global management roles," he adds. Within Unilever, the number of Indian managers has been increasing steadily over the past few years and over 200 managers of HUL currently serve the company globally in key leadership roles across markets and functions.